Christie’s yesterday shattered the previous auction record with its sale of post-impressionist works the New York Times reports today. The previous record was $269 million. Of the sale, about $125 million involved the sale of recently repatriated works which were looted by the Nazies during World War II. Before the sale, five of them were hanging in museums. 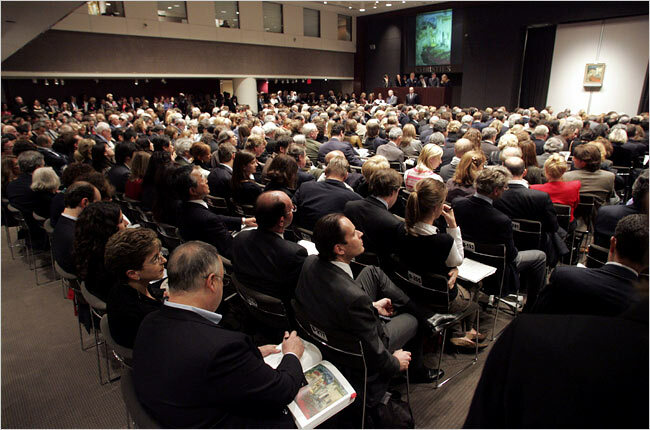 Christie’s does a good job of making these auctions a spectacle. I’ve never seen one firsthand, but they must be quite a show. Perhaps the most interesting aspect is the way many of the buyers are secret. We may never know who purchased some of these works. Certainly, we cannot argue that the heirs of holocaust victims are entitled to the return of works that was taken from them during the war. However, looking at the end result, are we all better off having these Klimt’s in a wialthy benefactor’s living room? I don’t think so. In my view courts should do a better job of fashioning compromise between nations and claimants. The image is by Hiroko Masuike, for the New York Times. Other images are available here.